Abbotsford Restorative Justice provides a voluntary process whereby victims & affected parties can have a meaningful voice into what needs to happen to repair the harms, when crime or wrong-doing has occurred. We work with referrals from the Abbotsford Police Department, Abbotsford School District as well as various other community referrals. We are respectful of traditional teachings and strive for a holistic view of health as set out on the medicine wheel. We work to make services accessible to the community. The Adolescent Day Treatment Program is a sub-regional community-based program providing a wide range of individualized mental health services and educational programming for adolescents with acute psychiatric illnesses. Young people from Abbotsford, Mission, Chilliwack and Fraser Cascade between the ages of 13-18 years inclusive attend the program four days a week from 9:30 a.m. until 3 p.m. for up to five months. The Anxiety Group for girls Grades 9-12 is a safe place to process your anxiety with professionals and peers. Child and Youth Mental Health Services (CYMH) provides a wide range of direct and contracted community-based specialized mental health services to children and youth under the age of 19 and their families on a voluntary basis. We offer private and group programs for children and youth seeking support with mental health and wellness by partnering with horses in nature. 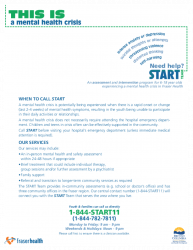 The START Team provides assessment and intervention services for children and youth (6-18) experiencing a mental health crisis and living in the Fraser Health region. A mental health crisis does not necessarily require attending the hospital emergency department. Children and youth in crisis often can be effectively supported in the community. Sundance Solace Society is a non-profit working towards removing funding and resource barriers that keep humans and horses in need from accessing a safe and healthy place of solace. Sundance Sundance is committed to offering access to mental health services that utilize horses and nature for individuals and groups who have limited financial resources. Family, teen, parenting support by a Registered Clinical Counsellor in Abbotsford. Affordable rates. A safe place where youth and families communicate and create together! Youth Resource Centre offers services for youth involved in the Youth Justice system. Youth probation referrals only. Youth are provided with a positive adult role model to increase youth resiliency and success. The Ministry of Children and Family Development provides a wide range of services to help young people and their families when they are having difficulties, when youth are sexually exploited, have an addiction to drugs or alcohol, are living on the street, have mental health problems, or a combination of issues. A Youth Probation Officer and Restorative Youth Justice Conference Program is also available for court referrals. View a list of helpful websites with resources for those looking for developmental and physical supports. Need help with a teen having a mental health crisis? View the PDF Below.